Apple's always on the forefront of tech innovation – or, at least, good at giving us reasons to want new tech each year. And this year's newest Apple Watch (the 4, if you're counting) is no exception. 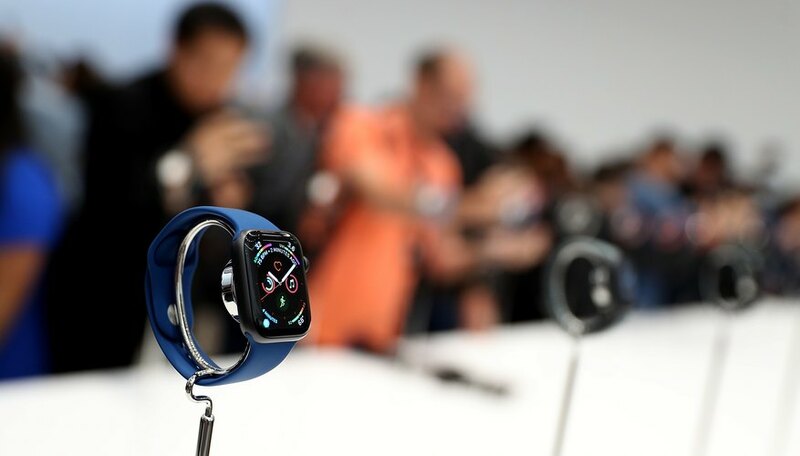 While every Apple Watch – not to mention a host of other fitness trackers at all different price points – already did a great job at tracking your activity and heart rate throughout the day, the newest Apple Watch takes in one step further. The newest watch doubles as an EKG — an at-home version of the technology doctors and hospitals use to measure your heart rhythm. Because it contains such advanced technology, the watch is actually considered a medical device, and had to be approved by the FDA. Well, yes and no. While the watch's EKG technology might be a great add for some people, it might cause unnecessary stress for others. Here's how it works (and why it's different than your standard heart rate trackers) and why you probably shouldn't pay too much attention to the EKG. First Off, How Do Heart Rate Monitors Work? Heart rate monitors are nothing new – but, chances are, you haven't thought much about how they really work. Most wrist heart rate monitors are optical monitors, which means they use LED lights to detect your pulse. The light penetrates the uppermost layers of your skin and illuminates the tiny blood vessels, called capillaries, underneath. From there, the watch tracks the way your blood moves through your capillaries, detecting your heart beats and ultimately giving you your heart rate. Chest heart rate monitors work differently: They rely on small electrode pads instead of LED lights. The electrode pad sits flat against your chest and, helped by electrical conduction via your sweat, picks up the electrical signals produced by the nerves that control your heart. Because they're measuring your heart rate directly, they may be more accurate than optical heart rate monitors. The Apple Watch combines the two approaches. You place your finger on the digital crown on the watch and it uses electrical signals to measure your heart rate and rhythm. But you get the comfort of wearing a watch, rather than a chest strap. Sounds Great – What's the Downside? Including EKG technology in the Apple Watch has a lot of upsides. It means the watch has a much more advanced ability to track your heart rhythms and detect any abnormalities. The up to 6.1 million Americans who suffer from a type of heart beat irregularity, called atrial fibrillation (or "a-fib") might benefit from being able to detect irregularities on demand, Wired reports. But if you're healthy and don't face an increased risk of cardiovascular disease, the EGC function may not offer any benefits. As Wired reports, several medical journals and organizations – from the U.S. Preventive Services Task Force to the journal JAMA – advise against EKG screening for healthy adults because it didn't improve patient outcomes. What's more, false positives in healthy people could lead to stress. If you're the type to consult Dr. Google every time you have a cold (no judgement, most of us do it!) having an on-demand medical device your doctor hasn't told you that you need may cause anxiety. Whether you update your fitness tracker to the Apple Watch 4 is up to you – but if you plan to use the EKG function, make sure you talk about it with your doc about how to use it responsibly first. Tremblay,, Sylvie. "The New Apple Watch is a Legit Medical Device – But There's a Catch." Sciencing, https://sciencing.com/the-new-apple-watch-is-a-legit-medical-device-but-theres-a-catch-13715211.html. 25 September 2018.